People are struggling to maintain control of their inboxes. We are inundated with marketing email and newsletters from hundreds of mailing lists. We subscribed to some of these newsletters knowingly, but to other lists we were automatically added when we interacted with the corresponding company. The truth is, we can’t possibly pay attention to all those messages — thus, many of us seek ways to curate subscriptions and control the type and amount of email that we get. That said, newsletters continue to be an important communication channel between organizations and their audiences. In our research, we found that recipients do value newsletters. They also value the ability to sign up and remain on mailing lists, but sometimes a newsletter that was once relevant no longer is. In this case, people want to be removed from the corresponding mailing list. Although users no longer want to receive your emails, the opt-out experience is still important, and should still be designed well. It’s not in your best interest to make it difficult to unsubscribe, or use snarky language with recipients choosing to leave. Doing so is short-sighted. Users may still like your brand, they just no longer want to receive your emails. Keep in mind that, if people keep getting unwanted newsletters, the messages will start to backfire and become regular reminders that they’re annoyed with your company. It’s best to politely let them go and maintain their respect for the future. Worse, if you make it too difficult for people to unsubscribe, users will report your emails as spam in order to no longer receive them. This is as easy as a click of a button in many email clients (and will reduce the deliverability of your messages to other subscribers). One user said, “If I can’t find the unsubscribe link quickly, I’ll hit Send to Spam. It’s easier — one click.” It’s much better to give your users an easy way out of their subscriptions. One of our studies for the Sixth Edition of the Marketing Email and Newsletter Design report was focused on the unsubscribe experience. Nine women and seven men between the ages of 19 and 46 participated in this study. All participants were employed. We observed participants as they selected 3–5 emails from their personal inboxes and went through the process of unsubscribing or managing their subscriptions. Here are the top takeaways from our newsletter unsubscribe research, in no particular order. (Left) A newsletter from Bluefly was not optimized for mobile, making it difficult to locate and interact with the Unsubscribe link. (Right) A newsletter from MyFitnessPal did a good job of optimizing the entire email message for mobile devices, including the footer. The Unsubscribe link was much more accessible. The link should have visual weight. Visual weight in design makes things stand out from their surroundings. It can be achieved in many ways — for example, by using a high-contrast color or font treatment or by isolating the link from the items around it. The link should look clickable (or tappable). People look for visual cues that something is clickable. Give them a conventional link signifier such as an underline or the traditional blue color. The link should be labeled Unsubscribe. This is what people expect the link to be called, so they are looking for this word. A different label is automatically more difficult to locate. Some companies use sentences like, To be removed from this mailing list click here. Others have more complex unsubscribe processes, so they label the link Preference center or Manage subscriptions. It’s best to name the link Unsubscribe regardless of the process to do so. 3. Too many choices and too much work to unsubscribe. People hate preference management. When they’ve decided to unsubscribe, they want off, and they want it to be a one click process. Countless participants in our research groaned with frustration when they clicked an Unsubscribe link that took them to a page full of checkboxes and questions. “I didn’t like this. I had to go to the screen and read and figure out what I’m doing. Am I checking or unchecking? If I wanna unsubscribe, I wanna unsubscribe, I don’t wanna go in and pick and choose different things.” These types of complex management pages are especially problematic on a mobile device. If your subscription-management page is too complex, explore ways to simplify it. Determine if all preferences are necessary or if some can be grouped together or broken apart into separate processes. Group and format newsletters for scannability. Most importantly, always provide a clear and salient Unsubscribe from all option at the top of the page. 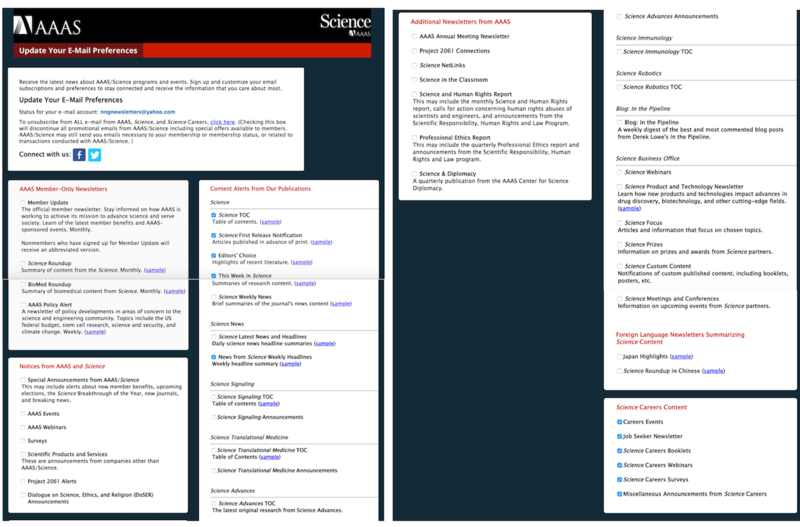 When unsubscribing from the Science Careers newsletter from Sciencepubs.org, users were taken to a very long page (broken into two screenshots here) of subscriptions grouped by type, including Members-only newsletters, Content alerts, Foreign language newsletters, Science career content. The process was overwhelming. Cofounder’s Lab’s communication-preference page included 17 options. Happily, there was an option to unsubscribe from all, but it was located at the very bottom. This page was overwhelming for one study participant. 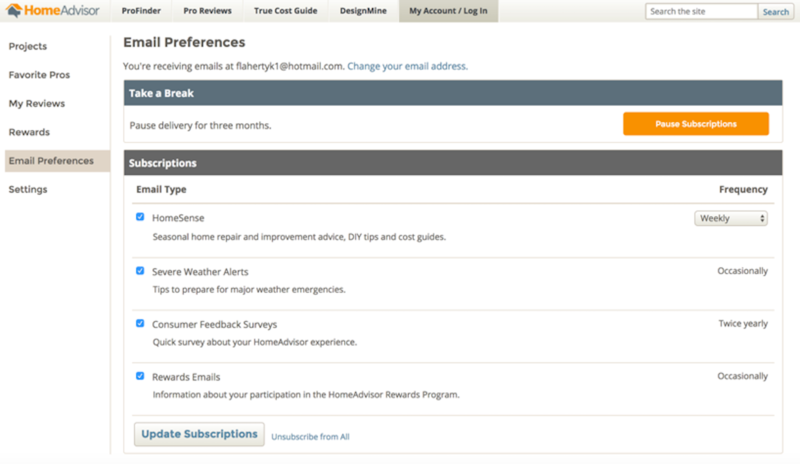 HomeAdvisor’s Email preferences page included options to pause subscriptions, deselect newsletters, and change frequency. However, the page formatting made it easy to distinguish among the options. The Unsubscribe from All link should have been at the top of the page and very easy to pick out. 4.Confusing checkboxes. 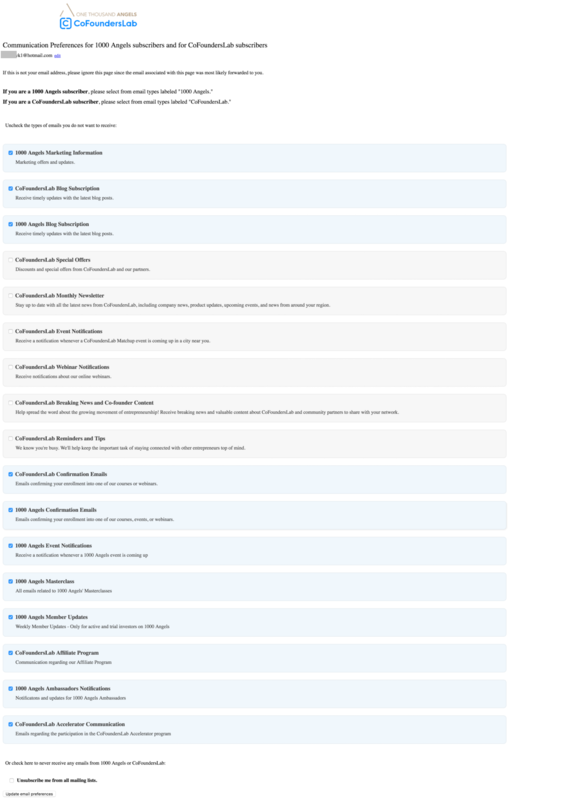 Some Unsubscribe pages made it hard to figure out what users were already subscribed to and how to remove themselves. Pages full of checkboxes can be confusing if it’s not immediately obvious what a checked box signifies. Typically, a checked box indicates you have opted into that edition, but some companies didn’t follow this standard. Including instructions about how to interact with the page does not make up for a confusing design. Most people will not read the accompanying text and will assume your design works like they’ve come to expect. 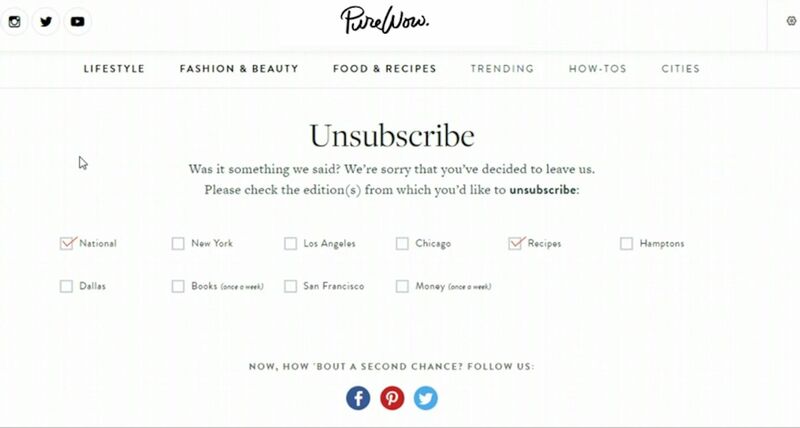 PureWow used checkboxes for each edition it offered, directing users to check the editions they no longer wanted to receive. This interaction was confusing and did not match the user’s mental model of the process. Checkmarks typically mean an item is selected, but here the checkmark indicated that the user did not want it. 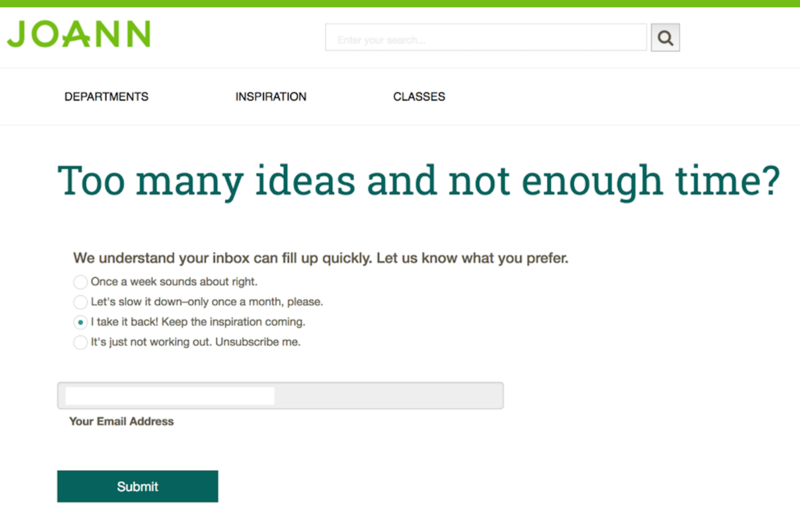 This design made it difficult to determine what newsletters the user was currently subscribed to. 5. Asking users to log in or provide personal information. Don’t make people go through extra work to get off your mailing list. Asking users to log in is a huge barrier, and is unnecessary. Newsletters and sites should be smart enough to know who clicked on the Unsubscribe link from an email message. Some companies ask for this information to ensure that nobody is mistakenly unsubscribed after forwarding an email to a friend. This scenario is rare and it is better to clearly display the email address that will be removed at the top of the Unsubscribe page to mitigate any accidental removals. 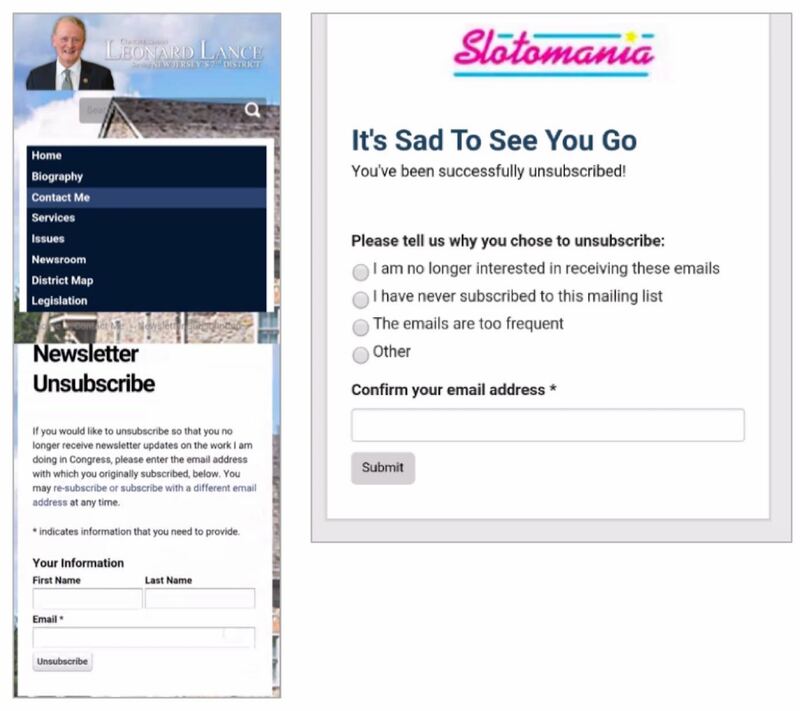 (Left) To unsubscribe from the mailing list of New Jersey Congressman Leonard Lance, users were asked for their name and email address. The email address was required. (Right) Slotomania also required an email address to be removed from the list. 6. Asking for feedback before confirming the unsubscribe. Some people don’t mind giving feedback after they’ve unsubscribed, but they don’t owe it to you in order to get out. 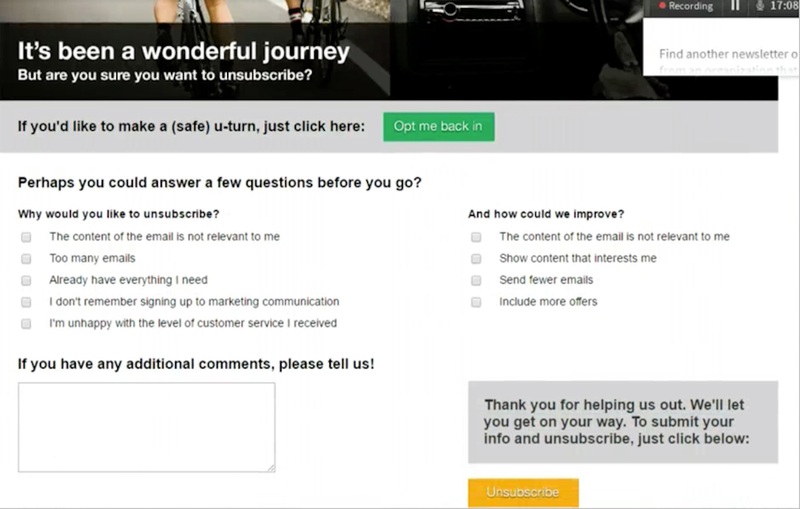 If you ask for feedback from users about why they are unsubscribing, do so only after they’ve unsubscribed. Make it optional and as simple as possible. 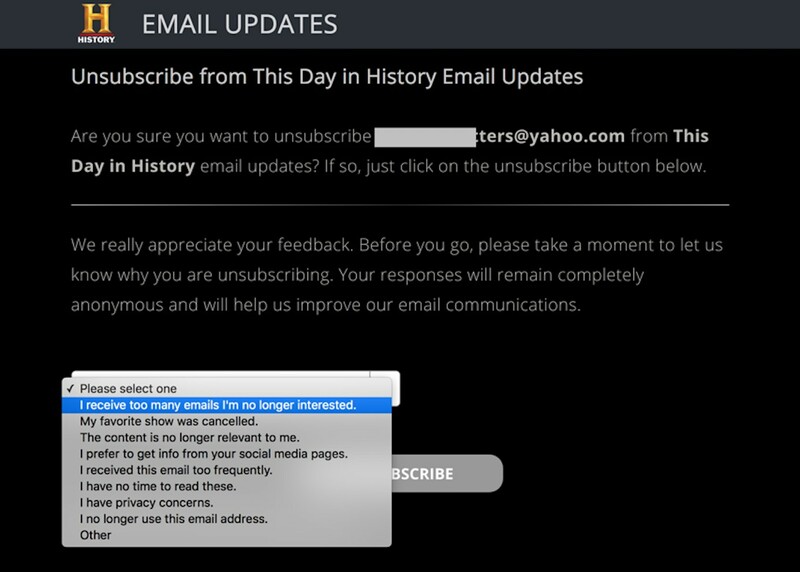 History.com asked users for feedback about why they were unsubscribing before removing them from the list. Although this selection was technically optional, the way it was presented made it appear as if it were required. Halfords.com asked users for multiple pieces of feedback before allowing them to unsubscribe. No field was marked as required, but all appeared as if they were. After unsubscribing from CNN’s 5 Things newsletter, a confirmation page was displayed, offering users the option to give feedback about their decision if they chose to. 7. Annoying tone. Even though users may want to unsubscribe, they may still like your organization. Don’t use a tone of voice that is condescending, whiny, or offensive. Aesop’s confirmation message was thankful and positive. 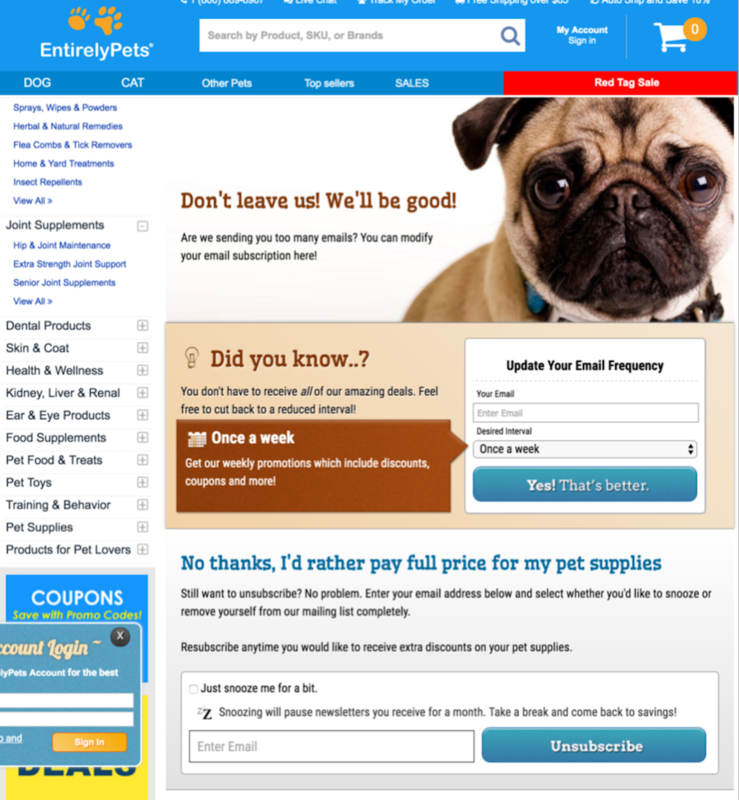 The Unsubscribe page for EntirelyPets.com had a whiny and aggressive tone, asking subscribers to stay, and using a manipulink approach to suggest that they are not smart for choosing to pay full price by removing subscriptions to deals and discounts. 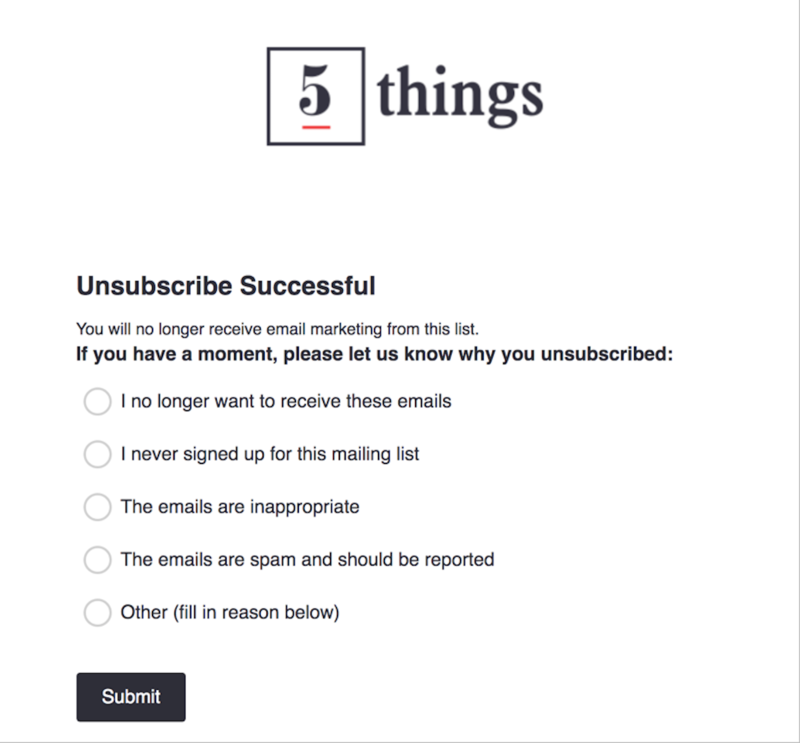 The Unsubscribe page on the Thrillist website had a snarky, off-putting tone and questioned the subscriber’s decision to unsubscribe. 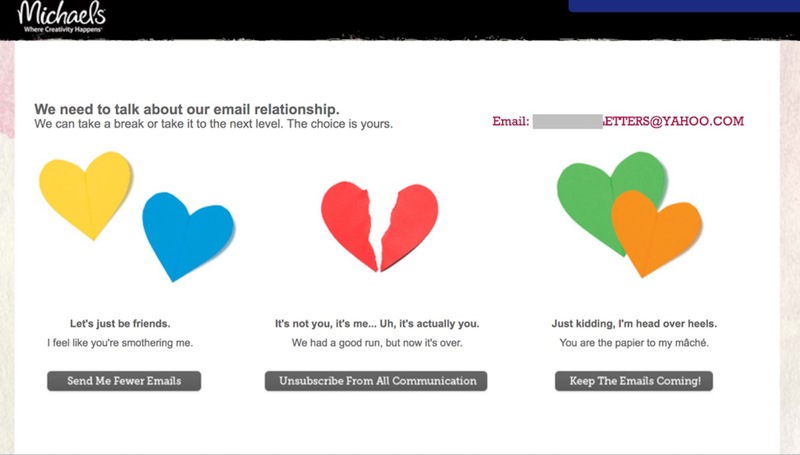 Some organizations can pull off a cute or clever tone on a Unsubscribe page if their brand identity is in line with this sort of approach. Companies that go down this path should tread cautiously, by not overdoing it and ensuring that the tone does not interfere with the task at hand. They should also know that users will have mixed reactions to this approach. Michaels tried to be clever and used language suggesting that the user was ending a romantic relationship with the company. 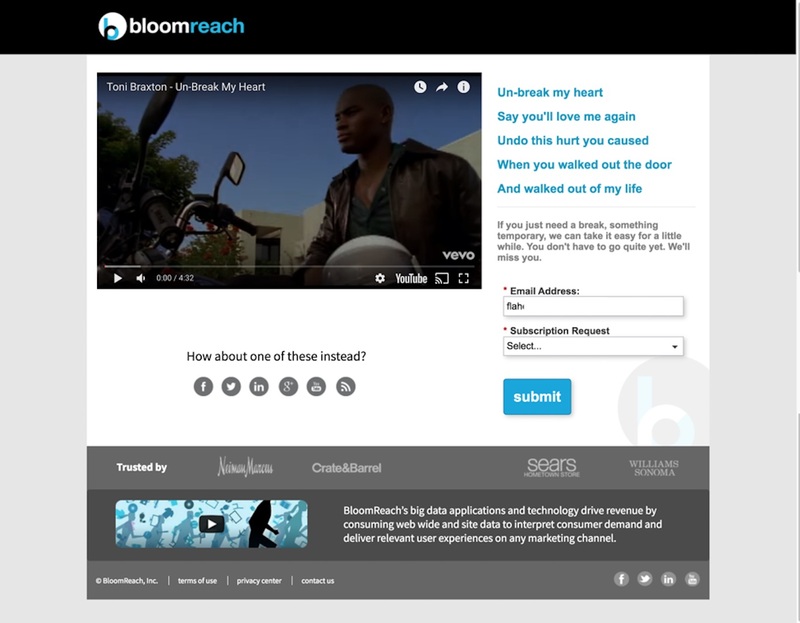 Bloomreach embedded a music video of Toni Braxton’s Un-break My Heart and used a few lyrics from the song on the Unsubscribe page. I personally thought this was funny, but this silly approach may not strike the same chord with others who may not even know this song. 8. Pushing users to resubscribe. Not once did I see someone come to an Unsubscribe page by accident or decide not to unsubscribe based on the persuasive messaging from the company. Users have already decided to unsubscribe. It’s best to just let them go. Some companies prioritized the options to resubscribe or stay subscribed over the options to opt out. Others went so far as to make the option to stay subscribed the default. These design patterns are misguided and can paint your company in a negative light. Users don’t appreciate trickery and unscrupulous tactics. 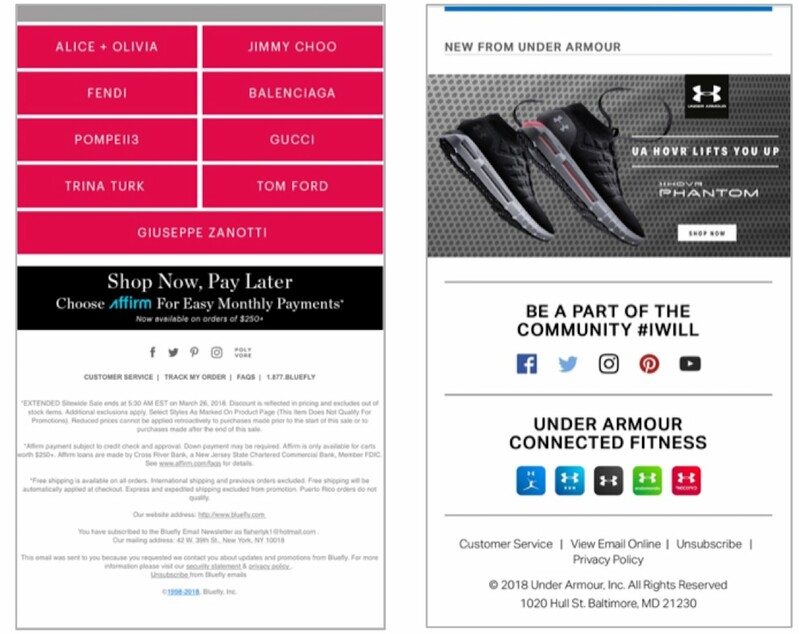 It can be appropriate to offer unsubscribe alternatives such as options to receive less frequent messages or to curate the newsletter content to be more relevant, but these options should not be prioritized over the Unsubscribe option. 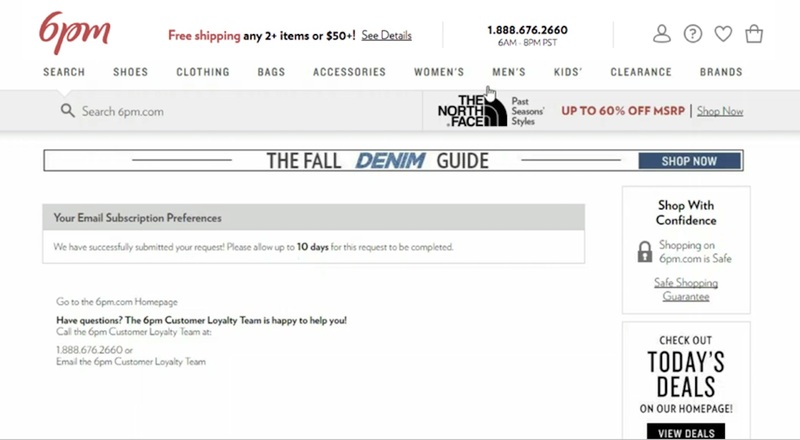 Joann Fabric’s brought users to a page with the option to stay subscribed automatically selected on the page. Some users may not notice this trick, and submit the form without changing the checkbox. This won’t bode well for Joann Fabric’s when people will keep receiving emails although they thought they had unsubscribed. 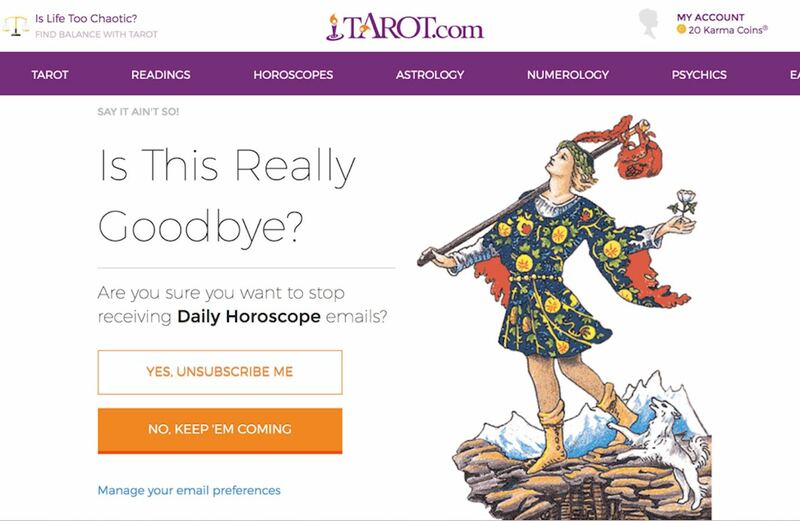 Tarot.com made the option to continue receiving email, big and bold a style treatment typically reserved for the primary action. Users who want to opt out need to pay attention and select the secondary button, Yes, Unsubscribe Me. 9. Email confirmations. Most of the time, users appreciate confirmation emails for recordkeeping and for reassurance that important transactions were completed. However, when people unsubscribe from your mailing list, the last thing they want is another email. Focus on confirming the change in subscription clearly on the website when they opt out, and forego a confirmation message in this case. 10. Delayed removal. Users expect to be removed from mailing lists immediately. If there will be any unavoidable delay, warn users accordingly by letting them know how long it will be before they’re removed from the mailing list. Make sure the delay is minimal. The longer the delay was, the more annoyed users were. Delays of 36 hours or less are acceptable. Beyond that, they are problematic. 6PM.com warns users that an unsubscribe request may take up to 10 days to be completed. 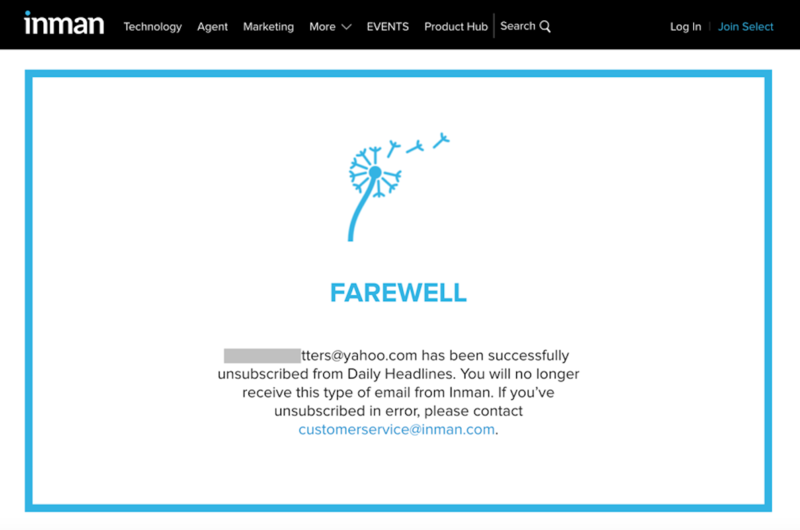 Inman News took users directly to a simple confirmation page after clicking the link to unsubscribe from the Inman Headlines newsletter. The full report on email marketing and newsletter usability with 199 design guidelines for email user experience design is available for download. This report includes even more on the unsubscribe experience and best practices for many other areas of email design.